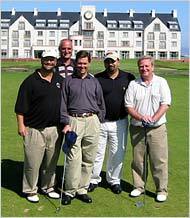 In a New York Times story on Ralph Reed's ties to the Jack Abramoff scandal, the paper of record runs a photo "of a 2002 golf trip to St. Andrews in Scotland" that shows, "from left in the front row, the lobbyist Jack Abramoff, Ralph Reed, David H. Safavian and Representative Bob Ney, Republican of Ohio." I don't think that's St. Andrews! And boy, amazing how those trench coats really slim down Abramoff!